Rachel Cox spent the tail end of her biology for non-majors class delving into the intricacies of global climate change. Cox, a sophomore, wrapped up the course taught by senior biology lecturer Dan Johnson with a final presentation this week. While many students have taken Johnson’s course before, Cox’s experience this spring was unique. She was one of a handful of students asked to test out a new kind of e-textbook as the sole take-home educational resource for a semester. Within three years, the approximately $30 BioBook is expected to replace the $200+ paper textbooks of up to 1,200 students taking general biology at Wake Forest and Forsyth Technical Community College. More students and schools are expected join the initiative as well, said Johnson, BioBook’s principal developer. The new collaborative initiative officially kicked off this semester. It will be incorporated into a multi-state $15 million Department of Labor initiative (led by Forsyth Tech) to help displaced workers find a new home in the 21st century workforce. Ayers said the new initiative is part of a longstanding relationship between Wake Forest and Forsyth Tech. For example, Forsyth Tech’s nanotechnology students learn how to work with electron microscopes at Wake Forest. “We hope to continue to strengthen our partnership by helping to improve BioBook and by working together to produce other science books,” Ayers said. 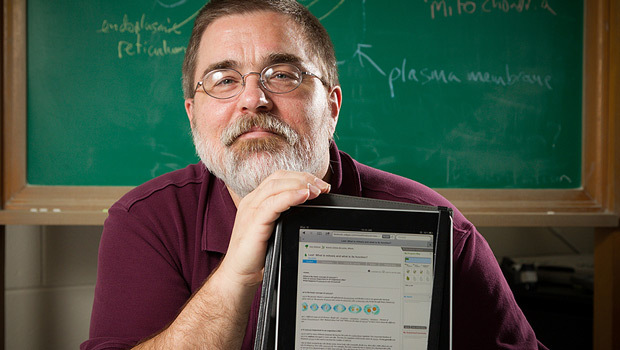 Perhaps the most useful aspect of BioBook will be its adaptability. Johnson said it will enable both teachers and researchers to track what learning tools worked for students at the end of the semester. Educators can then use this data to hone future lesson plans based on what is most effective for their particular brand of student.